Seed Potatoes should be cut into 1½ inch cubes, with each cube having at least 2 eyes. Let the seed potato pieces dry 1-2 days prior to planting. When setting, place the pieces 2 in. deep 1 – 1 1/2 ft. apart. Potatoes need sandy soil with good drainage. As the above ground potato plant grows, cover with fresh soil, leaving a minimum of 3 in. exposed. In case of a late frost, cover the potatoes with a thick layer of straw. Green shoots and raw shoots are poisonous if ingested. Dig new potatoes when the above ground plants begin to bloom. 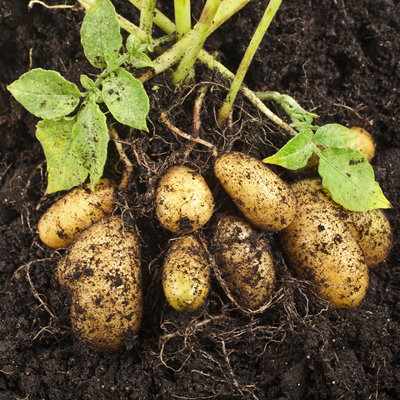 Dig mature potatoes when the above ground plants die down. Be careful when harvesting, so you don’t damage the tubers.